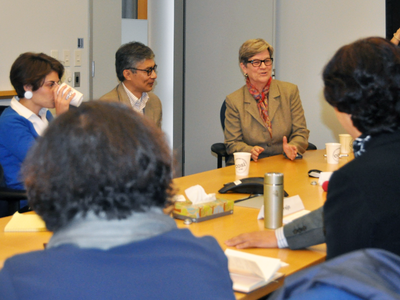 A group of five Chinese journalists visited the Annenberg Public Policy Center on Sept. 23, meeting with APPC director Kathleen Hall Jamieson. 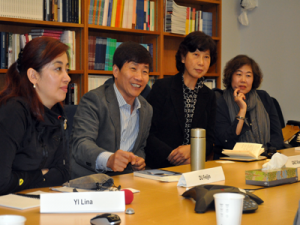 Journalists (from left) Yi Lina, Du Feijin, Gao Xiaohong and Zhan Liping visiting APPC. The journalists took part in the 2014 China-United States Journalists Exchange, on a study tour in Philadelphia and Washington, D.C. Dr. Jamieson, co-founder of the policy center’s FactCheck.org project, said the group talked about practices in Chinese vs. U.S. journalism, and especially how fact-checking works in the United States. FactCheck.org is dedicated to monitoring and evaluating the accuracy of claims by politicians. The Chinese group included Du Feijin, director at the news coordination department of People’s Daily, in Beijing; Gao Xiaohong, journalism dean at the Communication University of China, in Beijing; Yi Lina, associate professor in the Translation of the Uighur Language Department of China National Radio, Beijing; Wan Majia, editorial director at the Qinghai Province radio and TV station, in Xining City, Qinghai Province; and Zhan Liping, producer of “Focus Today” on China Central Television, Beijing. Annenberg School for Communication post-doctoral fellow Maria Repnikova and ASC professor Guobin Yang, with APPC director Kathleen Hall Jamieson, meet with the Chinese Fellows in the journalists exchange program. The group also met with Guobin Yang, associate professor of Communication and Sociology at the Annenberg School for Communication, and post-doctoral researcher Maria Repnikova.